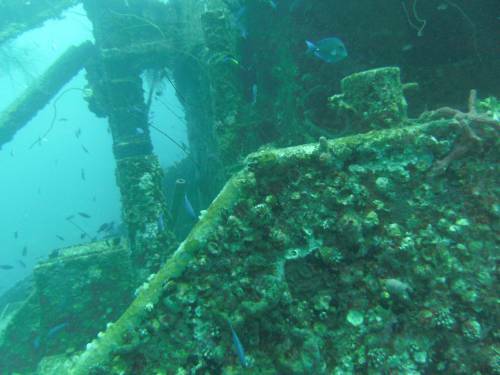 The deep dive site Superior Producer is one of Curacao's most spectacular ship wrecks. The unfortunate ship Superior Producer drove out of the harbor in September 1977, for it to never return back and stayed on Curacao. She rests upright in 30 meter of water and became a very healthy coral reef. The dive begins with a direct descent to 24 meter, where we start the tour. Big barracuda's and big French angels, have their habitat on the wreck. Swimming along the backside of the steering hut you'll see that the ladders are overgrown with cup coral, protected by white grunts and schoolmasters. The cargo space is open and easy to dive through. Lots to discover, but so little time, so ask about our discover nitrox dive, and stretch your dive time to explore the wreck even better. This dive is only for advanced divers and higher certified, since it is a deep dive. The wreck Superior Producer lies upright on a sand plateau at 32 meters. You can enter the wreck through the holds and bridge, but be aware of rusty objects. We often see barracuda's and large French Angelfish here. If there is a cruise ship or battleship stationed at MegaPier, or if the current and surf are too strong, this dive is not possible. Safety first!